The American iconic Coca-Cola soft drink is recognised around the world and is typically a household name for generations. It is the third most valuable brand worldwide and found in virtually all the countries on earth. It might perplex you to know that approximately 10,000 soft drinks from Coca-Cola are consumed per seconds a day and this is why the giant brand has remained on top of the world’s market. What are the other facts you don’t know about Coca-Cola? Read on to find out. Coca-Cola was invented in the USA in 1886 by Atlantan based pharmacist, John S. Pemberton. The brand name was coined by his bookkeeper, Frank Robinson, who created the unique flowing script that became the Coca-Cola logo which hasn’t changed much except for the addition of the white wave that was included from 1969 till date. What you heard is true! Up until 1903, one of Coca-Cola’s ingredient was cocaine – about 9 milligrams per glass. The product was originally marketed as a medicinal brain tonic for the relieve of exhaustion with properties from coca plant and cola or kola nuts – a source of caffeine. Currently, the company’s ingredient remains a secret, closely guarded and reportedly kept safe in a highly secured vault in Atlanta. After Coca-Cola was invented by John Pemberton, a businessman, Asa Griggs Candler bought and established Coca-Cola company in 1888 for $550. With aggressive marketing strategies, he sold Coca-Cola to the masses and made millions in return. The product is the most widely distributed on the planet and even now, of the 57 billion different kinds of beverages drank every day (besides water), over 3% (1.9 billion) are drinks trademarked or licensed by Coca-Cola. 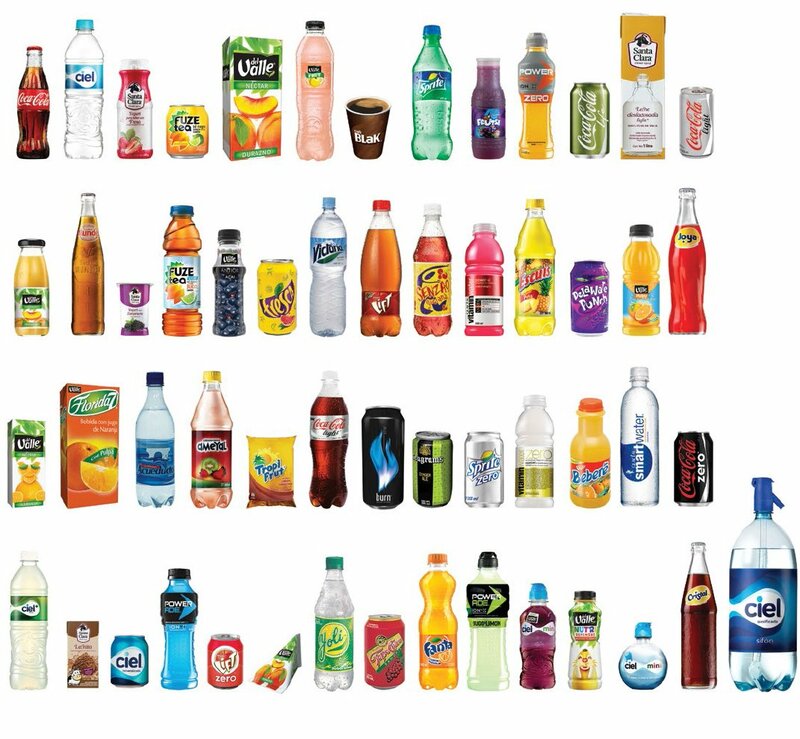 It is said that the company makes so many different beverages that if you drank one each day, it would take you more than nine years to try them all. The Coca-Cola company has a product portfolio of more than 3,500 beverages (and 500 brands), including sodas, energy drinks, and soy-based drinks. Coke owns 20 brands and each generates more than $1 billion in sales every year. The entire company’s brand worth is an estimated $83.8 billion, more than Budweiser, Subway, Pepsi, and KFC combined. It is also the 84th largest economy in the world, with global revenues of $35.1 billion (£25 billion) – ahead of Costa Rica. Coca-Cola drinks dominate all countries of the world except two – Cuba and North Korea. On the other hand, Mexicans are the biggest drinkers of Coke in the world. On average, Mexicans drink 745 Coke beverages a year. Americans drink 401 Coke products a year on average. A 1890s Coca-Cola advertisement showing model Hilda Clark in formal 19th-century attire. The company distributed sample coupons in late 1886, and the company believes it was the reason the drink spread from the small population of Atlanta to every region around the world. Between 1886 and 1914, one in 10 Cokes was given away free. Coke began its Christmas advertising in the 1920s to drum up sales in the slow winter months. It used several images, but none proved popular until 1931 when illustrator Haddon Sundblom painted a plump, jolly Santa in a red coat. The image was based on the Clement Moore poem “A Visit from St. Nicholas” and his own Scandinavian heritage. Previous images of Santa Claus ranged from him being gaunt, to very big, and he wore all different colours including green and brown. Aliases were formed between the company and McDonald who were on a quest to become the biggest fast-food chain in America. Ray Kroc approached Coca-Cola in 1955 to create a partnership with the already well-established soda brand. In one meeting and a single handshake, the partnership sky-rocketed both companies and the relationship still stands till date. Never one to miss an advertising opportunity, Coca-Cola was the first ever Olympic sponsor, beginning its sponsorship in 1928. During the wartime, when the company was given the (future) Presidential seal of approval in 1943, they got a contract from General Dwight D. Eisenhower, to supply six million bottles of Coke each month for US soldiers, escalating the brand to a new level of fame. While Coca-Cola and Pepsi have become firm rivals, it is believed that Coca-Cola actually had the chance to buy Pepsi on three separate occasions between 1922 and 1933. The Coca-Cola Company declined the offer every time. Coke became the first soft drink to travel to space. Astronauts tested the Coca-Cola Space Can aboard the Space Shuttle Challenger. Coke says – and we might agree with them – that to satisfy your taste buds to the very maximum, the perfect temperature to serve its beverages is between 34 and 38 degrees Fahrenheit. Coke claims its global name ‘OK’ is the second most understood term in the world, and recognised by 94% of people nationwide.